President Trump today, at a press conference with Russian President Vladimir Putin, said he didn't see "any reason" why Russia would interfere in the 2016 election, in response to a question on whether he believed Putin or U.S. intelligence agencies. 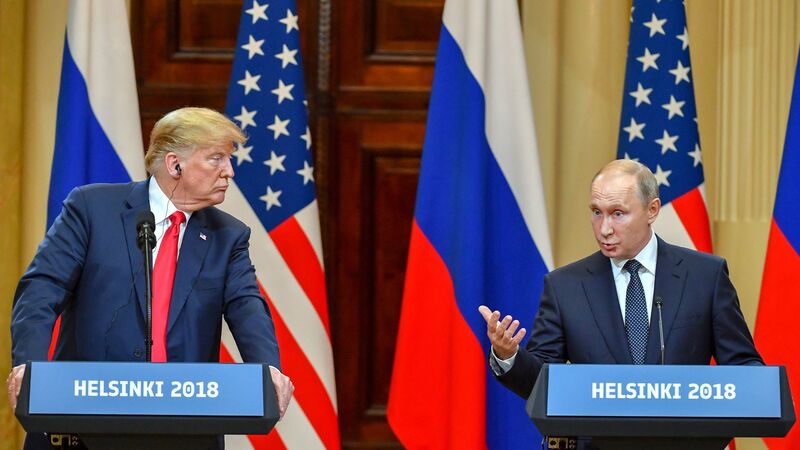 Our thought bubble from Jonathan Swan in Helsinki: "I just have no words. As press in this room, we are all sitting in here speechless and stunned. Trump cast doubt over the U.S. intelligence community and endorsed Putin’s denial. Trump was given an opportunity to denounce the meddling and he didn’t; he just pivoted to lines about the missing server and Hillary’s emails. While Putin spoke forcefully, lying, Trump nodded along. There’s no way of sugar coating or spinning this." Why it matters: This comes just days after Trump's own administration indicted 12 Russians for hacking the DNC with the intent of interfering with the election. The U.S. intelligence community has repeatedly concluded that Russia actively sought to interfere in the election, and plans to again. When asked if he wanted Trump to win the election, Putin said, "Yes I did. Because he talked about bringing the US-Russia relationship back to normal." On that deteriorating relationship, Trump said: "I hold both countries responsible. I think the United States has been foolish... I think we've all been foolish. We're all to blame." He called Putin a "good competitor," not an adversary. "I beat Hillary Clinton easily... We won that race. And it's a shame that there can even be a little bit of a cloud over it." "There was no collusion. I didn't know the president. There was nobody to collude with." Trump called the Russia investigation "a disaster for our country." When asked whether he believes the U.S. intelligence community or Putin over what happened in 2016, Trump said "I don't see any reason why it would be [Russia], I really want to see the server." He added, "President Putin was extremely strong in his denial." "Could you name a single fact that would definitely prove the collusion? This is utter nonsense. Just like the President recently mentioned." However, Putin offered to interrogate the 12 Russians indicted by the Justice Department.